Welcome to my website! My goal is to bring joy and happiness into the lives of the avid doll collector. Finding loving homes for many of the incredible works of art by several of the finest doll artists in the world today gives me great pride. I have personally been collecting dolls for over 23 years. 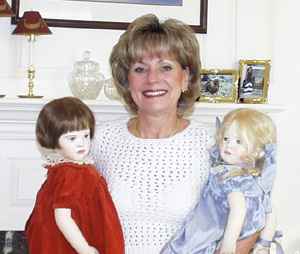 I have taken my passion for dolls and created this small business. I hope to provide for others the same delight and enjoyment I have found through these wonderfully inspired artists and their beautiful dolls. They will undoubtedly put a smile on your face and warmth in your heart!